Community Wind projects added 544 MW of new energy capacity in 2009. Community Wind now accounts for more than 4 percent of the overall U.S. wind energy capacity with 1,521 MW (Windustry) out of 35,159 MW total (American Wind Energy Association) for the country. Overall, new wind energy capacity in the U.S. for 2009 was estimated at nearly 10,000 MW compared to 8,500 MW added in 2008, a record high. Community Wind refers to locally-owned, commercial-scale wind projects that optimize local benefits. Locally-owned means that one or more members of the local community has a significant direct financial stake in the project other than through land lease payments, tax revenue, or other payments in lieu of taxes. Many states increased their Community Wind capacity during 2009. In California the Los Angeles Department of Water and Power added a 120 MW project. In Minnesota a number of Community Wind projects expanded their capacity including Willmar Municipal Utilities, Hilltop Wind LLC, Shakopee Mdewankton Sioux, and the Minnesota Municipal Power Agency. A list of more Community Wind projects for 2009 is available with the Windustry Community Wind Map web page. Fox Islands Wind Power Project is a new Community Wind facility on Vinalhaven, Maine, an island 12 miles off the Atlantic coast. Fox Islands is powered by three 1.5-megawatt turbines owned by the Fox Islands Electric Cooperative, and the project is managed by Fox Islands Wind, LLC, both based on Vinalhaven. The project will pay for itself in 20 years and reduce the electric rates of residents of the islands, which have been twice the national average up until now. Read more about Fox Islands Wind Power Project as an example of Community Wind on the Windustry web site. The American Recovery and Reinvestment Act of 2009 (ARRA) expanded the tax incentives available for wind energy development. Projects that are eligible for the PTC can opt for a 30% investment tax credit (ITC) instead of the PTC. Another new provision allows for a qualifying project to elect to receive a cash grant from the Treasury valued at 30% of the basis of the property in lieu of the PTC. These new incentives were designed to lower the barriers for financing wind energy projects, as in the past the PTC had primarily benefited corporate investors with passive income. Mark Bolinger at the Lawrence Berkely National Laboratory (LBNL) wondered if the new provisions could provide more benefits to Community Wind projects, those owned by farmers, landowners, municipal utilities, schools and other local entities. "It stands to reason that community wind, which has had more difficulty using the PTC than has commercial wind, may benefit disproportionately from this newfound ability to choose among these federal incentives," writes Bolinger in his report "Revealing the Hidden Value that the Federal Investment Tax Credit and Treasury Cash Grant Provide To Community Wind Projects." To confirm this idea, Bolinger analyzed two hypothetical community wind projects to guide a range of estimates. One project was a 10.5 megawatt utility-scale wind farm, while the other was a smaller 1.5 megawatt "behind-the-meter" project. Bolinger concluded: "On the basis of face value alone, the ITC or cash grant will be worth more than the PTC to most community wind projects." The ancillary benefits that accompany the ITC or cash grant can be just as important, including relief from the alternative minimum tax, avoiding PTC-related IRS "haircuts" for other project subsidies, no power sales requirement, less performance risk, and possible exemption from SEC regulations on cash grant securities. Read more and download a copy of the report. When President Obama signed the American Recovery and Reinvestment Act in 2009, the legislation contained a Buy America provision. This section 1605 of the ARRA requires that all of the iron and steel and "manufactured goods" used in ARRA-funded projects for construction, alteration, maintenance or repair of "a public building or public work" be "produced in the United States." As the ARRA programs have been implemented, many renewable energy developers have wondered how the Buy America provision will affect their projects, since a majority of renewable energy manufacturing happens overseas. The answer is that for the section 1603 cash grant in lieu of tax credits, the Buy America provisions do not apply. However, there are other incentives to which this requirement does apply--so it is important to consult with a qualified financial and tax advisor for any ARRA-funded project. In order to help recipients of funding through the U.S. Dept. of Energy, they have provided guidance documents and assistance on this topic. Read more about Does "Buy America" Apply to Tax Incentives for Wind Farms? along with related resources in our Policy and Research about Wind Energy section on the Windustry web site. Wind system installers, site assessors, equipment dealers and distributors, manufacturers, renewable energy program implementers, state funding agencies, educators, zoning officials, policy makers, and other stakeholders are encouraged to attend. Those considering entering the small wind industry are also invited. This conference is not intended for homeowners or end users. Register for the Small Wind Conference 2010 on June 15-16, 2010 at the Small Wind Conference site. Sponsorship and Exhibitor opportunities are available; for more information please contact Samantha Smart Merritt at 612-870-3474 or Samantha@windustry.org. This is a regional conference bringing economic development, agriculture and wind energy together to advance opportunities for locally-owned clean energy production. We will share experiences and information to harness the growing momentum for new models, new policies, and new projects. Who should attend Windustry's Community Wind Energy 2010: farmers, rural landowners, economic development professionals, elected officials, business and community leaders, tribal representatives, financiers, city planners, and any interested individuals. Registration, sponsorship and exhibitor details will be available soon. Visit www.windustry.org or contact Samantha Smart Merritt at 612-870-3474 or Samantha@windustry.org. All we need to do is set our sails. 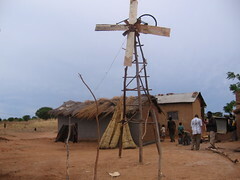 William Kamkwamba was inspired by the winds of grace and by his own profound imagination when, at age 14, he built his own windmill out of found objects and recycled garbage to provide electricity to his family home in Malawi. William's family could not afford the $80 tuition fee to send him to school and struggled to feed a family of eight. William sneaked into school anyway and used the small local library when he could. When he came across a book about Using Energy, he saw photos of windmills and became inspired to build his own. He scavenged to find parts and over the course of two months built a 16-foot windmill that powered a light bulb in his home. Lisa Daniels spoke during an information briefing at the U.S. Senate on "Community Wind, Benefits and Opportunities in a Carbon Constrained Economy" sponsored by the agriculture energy alliance 25x25. We spoke on a Harvesting the Wind Panel at the AgConnect Expo sponsored by 25 X 25 coalition in Orlando FL. We gave an Introduction to LWEAs and led an evening session on Community Wind at the Central Montana Wind Energy Update in Great Falls and Cut Bank, MT. Windustry participated in the Dupont Summit, 2009, hosted by the Policy Studies Organization in December at the Carnegie Institution for Science in Washington, DC.